This book is the outcome of a decade of research on the neu- roanatomical mechanisms of learning in the young laboratory rat. It is essentially a discourse on the functional organization of the brain in relation to problem-solving ability and intelli- gence. 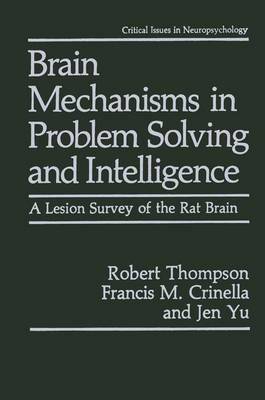 During the period between 1980 and 1989, well over 1000 weanling albino rats were subjected to localized brain damage (or sham operations in the case of the controls) under deep anesthesia and aseptic surgical conditions, were allowed tore- cover, and subsequently were tested on a wide variety of prob- lems designed to measure general learning ability. Since vir- tually every part of the brain rostral to the medulla has been explored with lesions, it has become possible not only to map a number of "putative" brain systems underlying the acquisition of distinctive problem-solving tasks, but to isolate several neu- roanatomical mechanisms that appear to be selectively in- volved in the acquisition of particular kinds of goal-directed learned activities. Of particular interest was the discovery of a "nonspecific mechanism" (previously referred to in our re- search reports as the "general learning system") inhabiting the interior parts of the brain. One objective of this volume was to make these maps available in a single source. Another was to provide a descrip- tion of learning syndromes arising from local lesions to differ- ent parts of the brain.